Lemon Rice / Lime Rice is a tangy delicious rice that is quick and easy to do. With just left over rice this can be made in a jiffy. Although I am never a big fan for lemon rice, neither my husband I never made an effort to make lemon rice and post a recipe here. 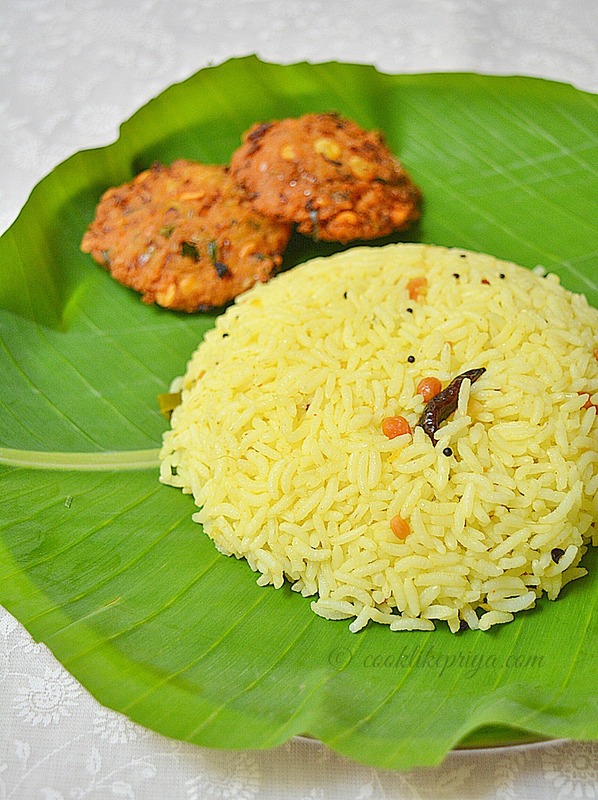 But since this is one of the most famous South Indian mixed rice recipes and also being my Dad's favorite I wanted to post it here on my blog. 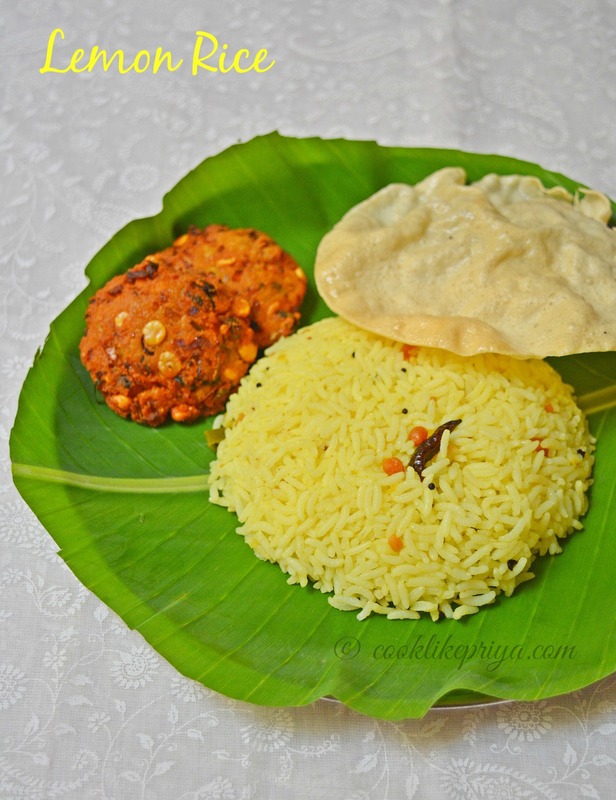 Usually appa loves to have lemon rice with masala vadas and appalam but you can pair it with any combination that you like. 1. Make sure that the rice is fluffy and grains are separate, this consistency is very important you can use any long variety rice or the usual boiled rice variety. Make sure rice is in room temperature and not hot. 3. Squeeze the lemon juice and discard the seeds and add turmeric and salt to this. Mix well set aside. 2. Once the rice is ready, take a skillet and heat it up, add the oil once hot splutter the mustard seeds, urad dal, channa dal, curry leaves, green/red chilli, curry leaves, ginger and stir fry them well for 30 seconds. 3. Switch off and add the lemon juice (make sure to remove the seeds) and turmeric powder mix. 4. Once the base is ready pour it over the rice and mix well so that all the rice is flavored with the lemon base. 5. Garnish with corrinader leaves and serve. 1. The rice has to be fluffy and perfectly cooked. The grains need to me separate and also at room temperature. 2. Make sure that the lemon is fresh and not too sour. 3. Usually we use boiled rice but you can always use basmati rice or any long grain rice variety. 4. Lemon rice usually requires a little more oil than usual, it adds great flavor and taste. You can use any oil variety as per your taste. 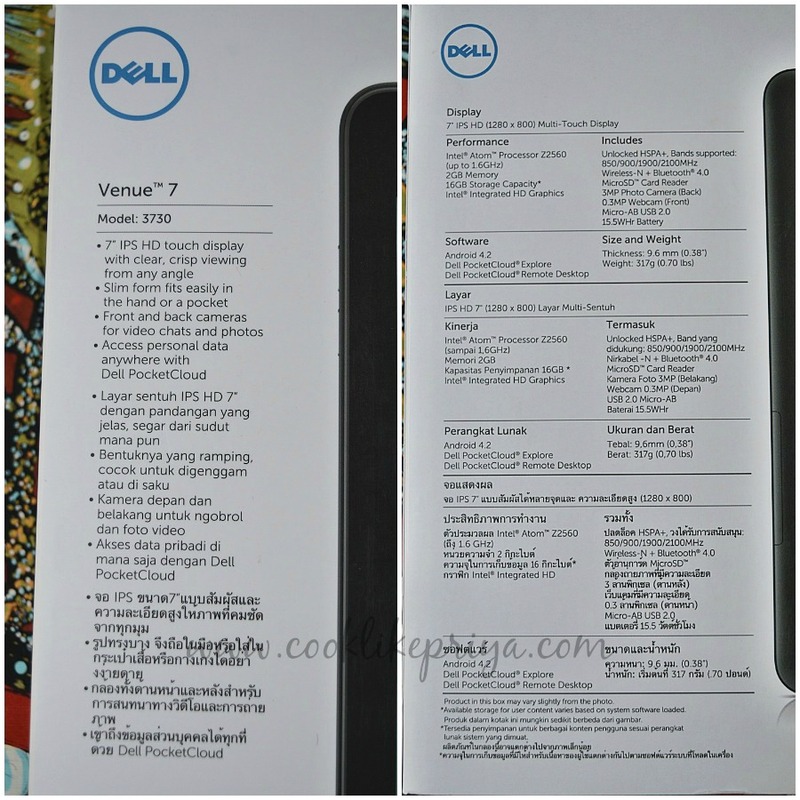 My life with Dell venue tab has been a great journey and I have been writing to you with my experiences with Dell and all that it has to offer. Dell being a renowned company for laptops has ventured into the tablet market and delivering quality tablets to customers. I must thank Dell for giving me this opportunity to write about their product. Off late I find myself hooked on to the tablet than the laptop. I enjoy using the apps and carry it along with me where ever I go. Today I wanted to share my thoughts on the video quality and youtube experience. I am a huge youtube addict. 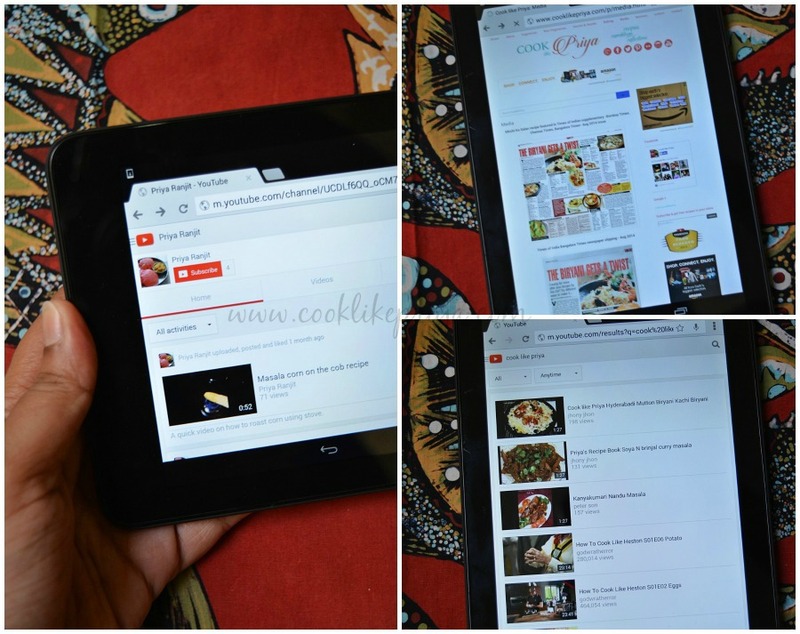 I have subscribed to various youtube channels and I keep getting updates on recent videos, my interests are cooking, sewing, songs, music, baking and gardening. So youtube has been my go to since I don't know when. Using a tablet for my needs fits in so handy like I said browsing is a breeze through Dell and there are other features in Dell which seem a little compromised like camera, video quality and battery life. I hope Dell brings out the best in their future but if you are looking for a everyday browsing tablet then Dell offers its best. Dell Venue picks up 2G 3G & micro sim which a great news for people like me who love to carry a tablet along with them. Its great for navigation apps like google maps. I also find the connectivity to social apps like facebook & twitter quite good.